Many accounting firms claim to be different, but the fact is it’s difficult to distinguish one from the other. What separates us from the pack? 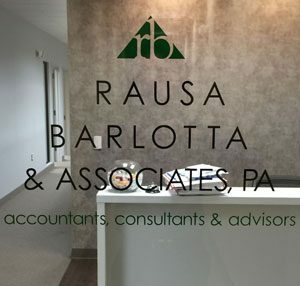 What makes Rausa, Barlotta & Associates unique? Quite simply, we look beyond the numbers. We realize that every client, big or small, has a dream and the answer to unlocking that dream is not necessarily contained on a Tax Return, a Financial Statement, or a Brokerage Account. At Rausa, Barlotta & Associates, our goal is to understand your total vision. We accomplish this by taking the time to talk and, more importantly, listen to our clients. Because we encourage this constant interaction, our clients view our role not as accountants, but as trusted financial advisors. And by developing this close relationship, we become more effective for our clients by targeting those services that they really need. We are glad to offer a FREE no obligation initial consultation and review of prior year’s tax returns. Please call us at 201-689-0777 or fill out our free consultation online form. We look forward to hearing from you and having the opportunity to help you. Cost effective, specialized accounting services for all areas of business. Tax planning and preparation for individuals, partnerships, corporations, estates and trusts. Accounting and Business Planning for Dental and Medical Practices. Cost-effective, specialized services to startup companies. Cost effective, specialized accounting services for all areas of your business. Steve Barlotta has over 30 years of diversified experience in the public accounting industry. He believes that the key to developing long-term relationships with his clients is to take the time and listen to them. By doing this, he can be more effective for them by targeting the services that they really need. More about Steve Barlotta.